Tiger Inn where combines charming Tiger design and splendid hospitality atmosphere with the international standard offers you spacious air-conditioned rooms, well equipped with private bathroom, bathtub, shower including a variety of convenient amenities. 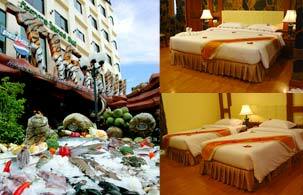 In addition, best restaurant with fresh seafood and international dishes are also served here. Tasty steak house is impressively provided while enjoying pool club which is serenaded by beautiful music. All rates are net inclusive of government V.A.T. and breakfast. All rates are quoted in Thai currency and may subject to change without prior notice.